• We’ll select at least one image from every participant to appear in our 1st ever “Seattle-Gdynia: Our Lives” Magazine which will be available for purchase at the September unveiling! • ALL images will be shown at our September 14, 2012 Sister City meeting as our program! 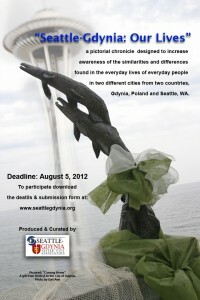 We invite you to submit up to 10 images taken anytime between January 1 2012 and July 31st, 2012. Dig through your archives or look for new opportunities to record an image now. There is no fee to submit your images. All entries must be received by August 5, 2012. Please include your registration form along with your CD or files. The SGSCA September 14 meeting will be our ‘release’ party for the magazine and unveiling of our slide show. Your purchase of a magzaine will help build the community that sustains our association.